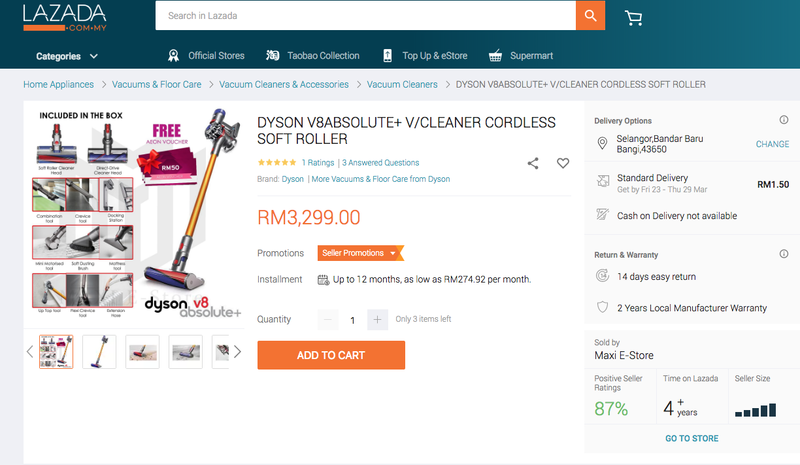 I have been a customer of Lazada since two years ago. I never would have thought that Lazada would become a place I go to for almost anything. The key to shopping at Lazada is to always look out for flash sales and coupon code discount. You also need to be aware of a special discount code sometimes given when you made a purchase through the Lazada app. Sometimes when I got an itch for shopping and payday is so far away, I like to browse Lazada catalogues and made a wish lists. It's a therapy for my soul and help me to increase my vibration. Visualisation is the key to manifest "things "into your life. I have never felt this excited about vacuum before until I laid my eyes on Dyson cordless vacuum. I can't believed how light the vacuum is. I am definitely putting this vacuum in my wish list. I have never tried an air fryer before. I think now it's the time for me to venture into cooking with all these cool technology available. It would sure be nice to have Alexa in my room. I wanted a smart home speaker ever since two years ago. When I saw that Lazada can shipped Amazon Echo I got excited. I can't wait to welcome Alexa into my new home. I am not sure if I will ever buy a smart TV from Lazada but it is still nice to monitor the price or may be get to compare brands on a single website. I have not buy any new TV in a really long time. If I am in the market for a new TV this definitely will be my first choice. I am not really sure if this model is old or new. I need to do more research on sound bar. I would love to have one for my new TV hehehe.. It has been a long time since the last time I watch TV with a sound system that can shake a room. I have always been a fan of Michael Kors watch. I have been collecting them over the years especially when they have one in rose gold. I would very much love to own a smart watch from Micheal Kors. This one looks so pretty. I have no idea that Lazada carry Michael Kors brand. I am so excited with this find! My dream home is to have all of my appliances connected to a home kit. I would very much like to control all of those devices from my phone especially when it comes to using Air Condition. Hopefully in the future Lazada will continue to grow and will add more and more appliances that are "smart" with build in IOT and bluetooth connection. It would be great to just tell Siri or Alexa or Google to do stuffs for you including looking for lost socks and lost keys!